Nu-Again follows a comprehensive deck cleaning process to smooth the restoration process and ensure quality results on every project. Feel free to familiarize yourself with our deck cleaning process, and Contact Us for Deck Cleaning Service. A Nu-Again representative will give you a free no obligation evaluation of your exterior wood surface and estimate of our Restoration & Preservation Process. Enclosed, your quote will offer different solutions for your wood care needs. A Nu-Again wood care professional will clean your exterior wood surface to remove mildew, moss, debris, and dead wood fiber. This is done with various pressure cleaning equipment using environmentally safe techniques to ensure the best for your wood and everything around it. Apply safe Pre-Cleaner, "Allows for a non-aggressive power wash, safely removes mold, mildew, algae, and dead wood fiber." 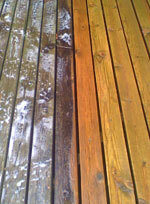 Power wash all wood surfaces. Brighten all cleaned wood. "Restores natural wood tones." Is your deck cleaning service complete? Time to move along to our Deck Sealing Process. Please feel free to call us at 833.200.7822 or fax your requests to 630.513.6915 for superior deck cleaning services.